Inder Loves Folk Art: Joe's first day back at preschool! Here is Joe, ready to start his second year at Peter Pan Nursery School! Joe is a "big kid" now and will be attending the half-day program four days a week. I have a planning commission meeting tonight, so sadly, I left the house before Joe got up this morning, and won't be back until after he's in bed. Boo. Sucky timing, for sure. 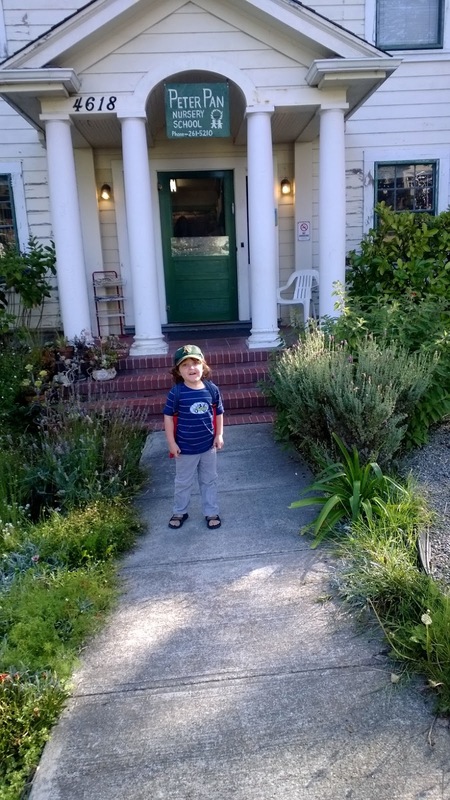 But Steve sent me this photo of Joe in a mama-made t-shirt (an as-yet unblogged Flashback tee I made from a thrifted shirt with a Mickey Mouse applique) his mama-made backpack, and his A's cap (just like Dad's), and that cheered me up. Apparently Steve was barely able to get this shot before Joe ran inside to play! What a world of difference from last year, when Steve stayed with him all day at school for well over a week to help him get adjusted and used to being left behind. We were so worried he would have a hard time adjusting, but we needn't have been: Joe absolutely loves school and it has been such a positive experience for all of us. This year, Joe is like, "Peace out, Dad! See ya!" and he's gone. Happy new school year, Joe! We are so proud of you! Oh he looks so excited! And goodness so grown up! All these kids growing so fast...sniffle indeed! It is so fantastic that he loves (pre)school - but yet another of those bittersweet parenting moments. Yes, I wish Joe could stay at Peter Pan forever! It's that great! He probably will stay an extra year to give him some more time to catch up with his peers in his communication and social skills, and I am honestly happy that this is an option for him. I really am so grateful! You have no idea! (Or, actually, I bet you have a very good idea!) It has been one thing I have NOT worried about in the past year. That is freaking MONEY in my life. I kept Hugo at kindy a year longer and he bloomed once he got to big school.